My day definitely looks up when my wine glass contains a treat from Jordan Winery. Particularly when that wine happens to be their signature Cabernet Sauvignon. Our weather has been, shall we say, chilly, and a big red wine warms the soul when the thermometer can’t seem to get up over 9 degrees. 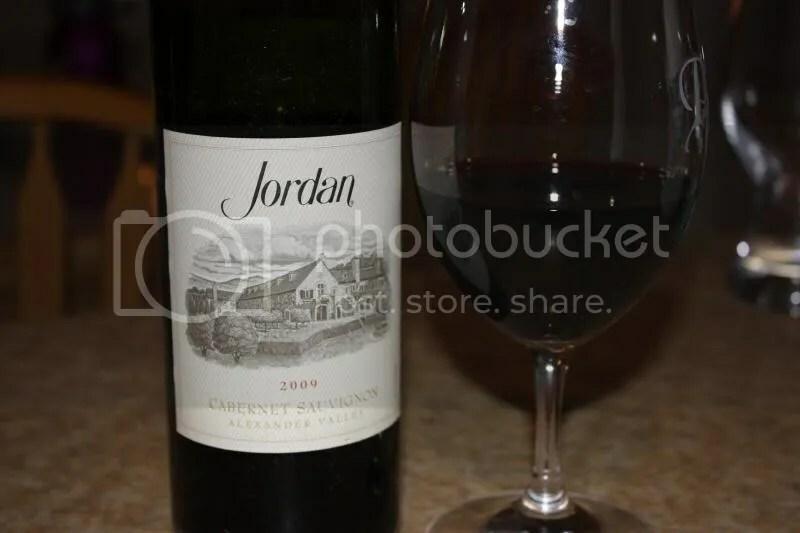 On this evening, we had the fortune to try the 2009 Jordan Cab Sauvignon. 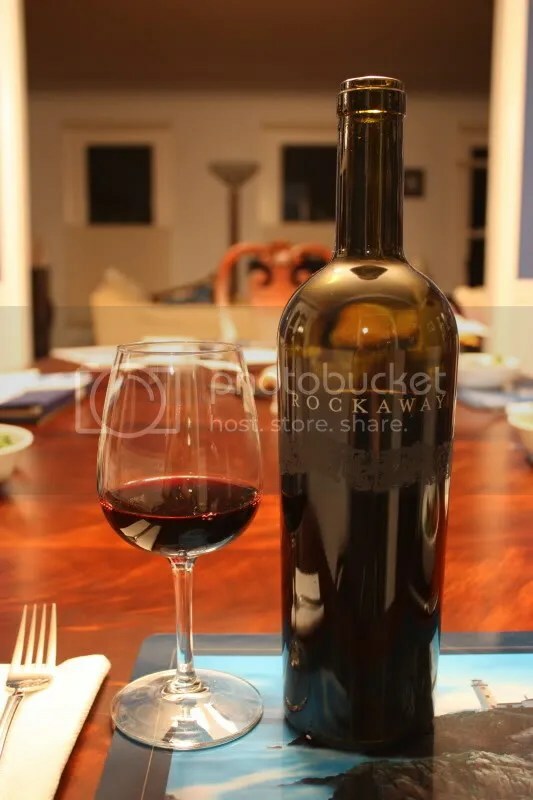 The wine has a real cork closure, clocks in at 13.5% alcohol by volume, and retails for $53. 1.) We drank this with grilled lamb done with rosemary and garlic. Absolutely fabulous match. 2.) I really appreciate that Jordan keeps their alcohol levels pretty darn reasonable for a CA cab. I enjoy not feeling like my nose is on fire when I smell a wine. 3.) I’m not sure I ever got around to posting about our visit to Jordan, but if you get the chance, you should definitely try to go on your next trip to Sonoma. 4.) Jordan only does two things: Cabernet Sauvignon and Chardonnay. And it does them really well. On the nose I got pepper, black fruit, bramble, slight green notes, black cherry, and baking spice. In the mouth I found blackberry, black cherry, a mineral streak, and herbal notes. Overall the Jordan had great structure and acidity to carry it through. *Disclaimer: I received this wine as a sample from Jordan Winery. Jordan knows how to make a good thing, so they stick to it. 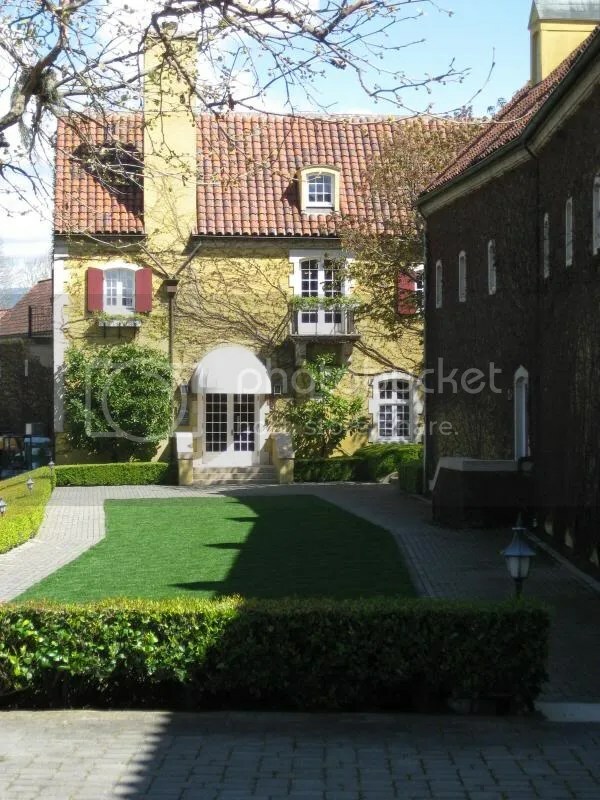 They make Chardonnay and Cabernet Sauvignon and that’s pretty much it. (Sorry, I appear to have misplaced my photos of this bottle. For some reason I lost a week’s worth of photos somewhere in the ether.) 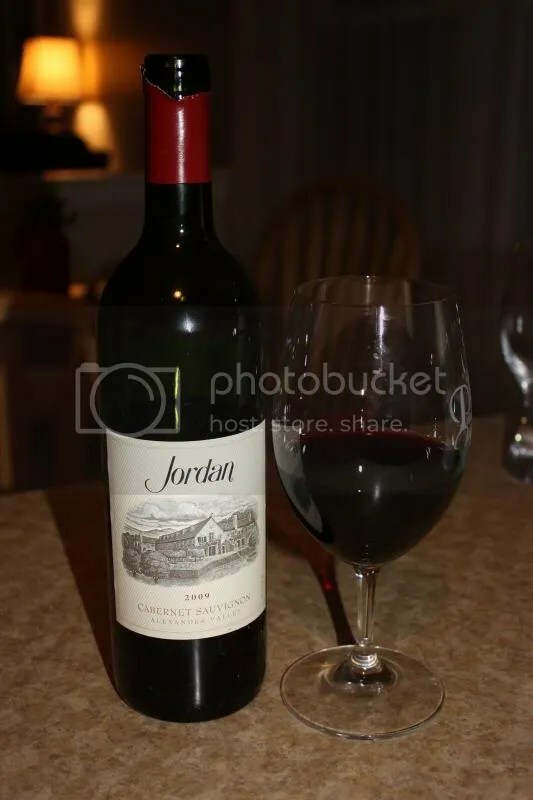 Tonight we tried out the 2008 Jordan Cabernet Sauvignon which clocks in at 13.5% alcohol by volume, has a real cork closure, and retails for $52. Jordan also makes estate olive oil, which is very yummy. Technical term. 1.) Serving something juicy, red, and cow-based for Christmas? Serve this. 2.) You can get lost in the nose of this wine. 3.) 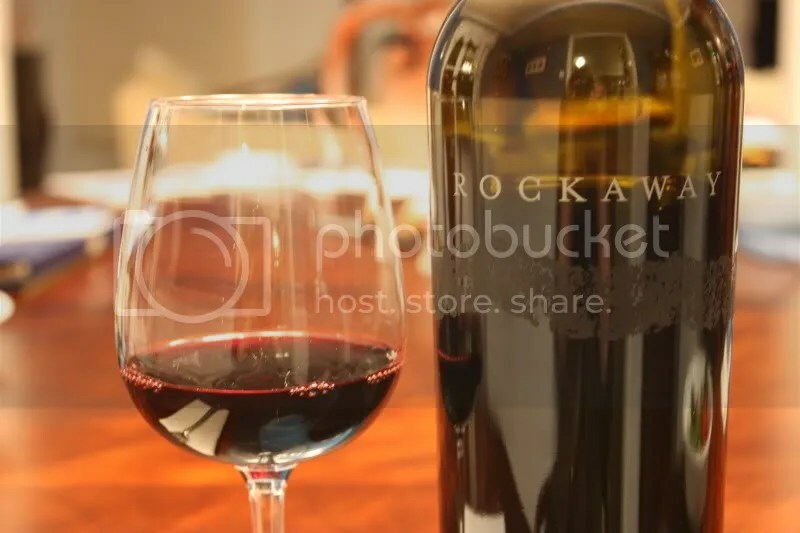 If you can unbury your nose from your glass, the palate of the wine has a ton to offer as well. 4.) Jordan’s Cabernet is great right out of the bottle but they age wonderfully as well, as evidenced by a tasting I did at Jordan last spring. On the nose I got black currants, berries, cigar, herbs, spice, cardamom, chocolate, roasted coffee beans, and bay leaf. The wine has one hell of a nose. In the mouth I found black cherry, black currants, spice, chocolate, herbs, and berries. Overall I found the wine to be juicy with lots of a depth and a long finish. We actually got some snow the other day/night in VA. In October. That is pretty much unheard of for this area of the country. The snow turned my thoughts to the big red wines that have been patiently waiting in my cellar all summer for me to drink them. I decided it was the perfect time to crack open the 2007 Cornerstone Cellars Napa Valley Cabernet Sauvignon. The wine clocks in at 14.5% alcohol by volume, has a real cork closure, and retails for $60. 1.) It’s still a baby. But some time the decanter cures that easily. 2.) If you’re thinking about serving something along the lines of beef tenderloin for any of your holiday meals, this is the wine for you. 3.) 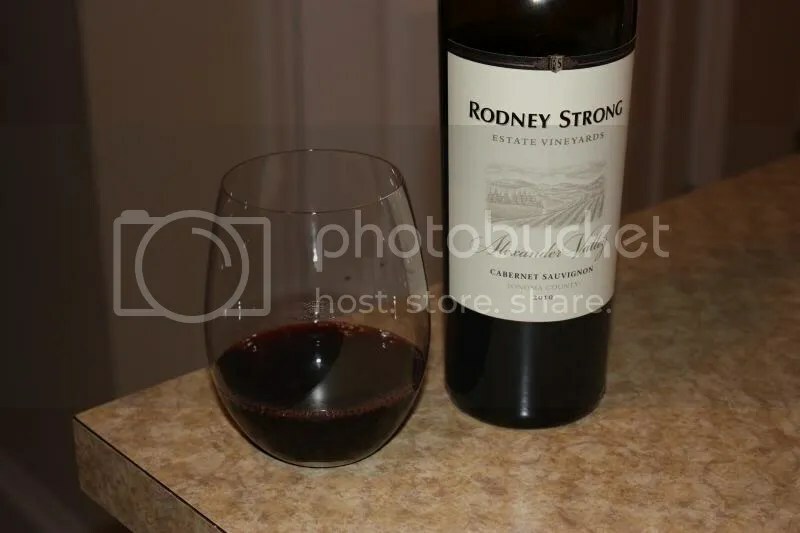 Cornerstone Cabs have been among my favorites since I first tasted them…many moons ago now! 4.) If big, black fruit and hints of pepper are what you look for in a Cab, you will love this wine. On the nose I got berries, chocolate, earth, pepper, herbs, and black cherry. In the mouth I found more black cherry, blackberry, chocolate, blueberry, and anise. The wine was quite tight at first, with tannins to spare. 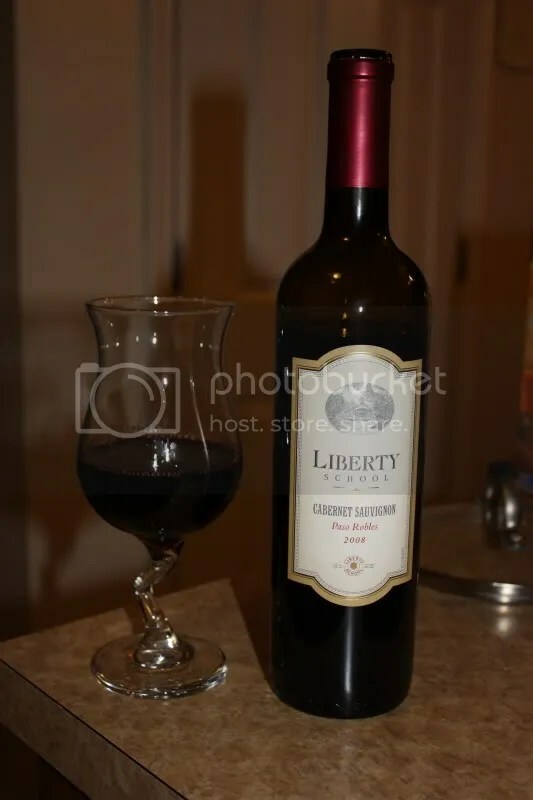 I ran it through my Soiree which definitely helped open it up, but I think a few hours in the decanter before serving would really do the trick for this wine. 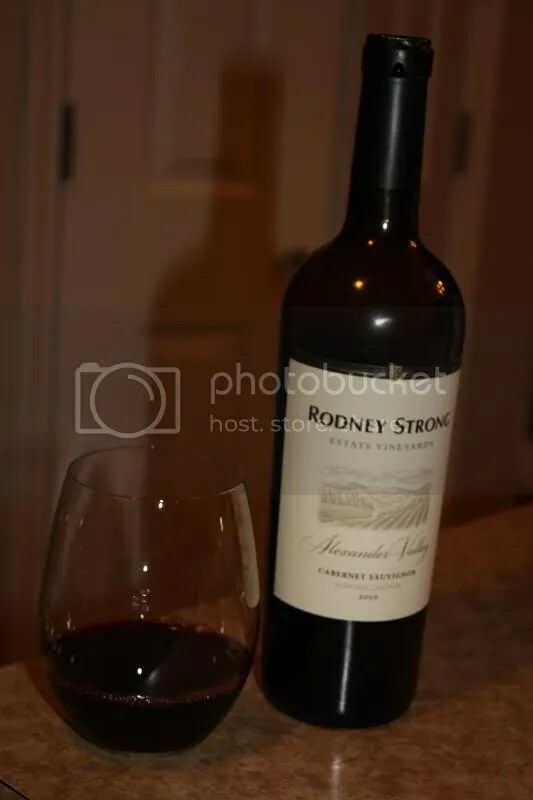 I served it with NY Strip steaks on the grill, and as always, this Cab is plenty big and firm to marry nicely with the steak. 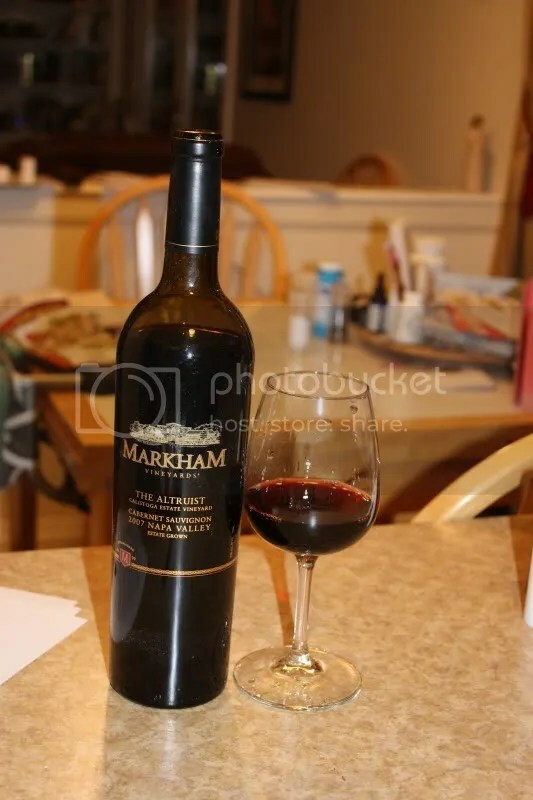 *Disclaimer: I received this wine as a sample from the PR company for Markham Vineyards. Community activism + wine = Markham’s Mark of Distinction. Three years ago Markham Vineyards began a program called “Markham Mark of Distinction,” inviting charities to apply for a $25,000 grant in order to make a tangible difference in their communities. This year’s nomination period ended on July 31, however, I urge those of you who might be interested to keep the program in mind for next year. At the end of this month voting on the finalists will open, so be sure to check back on the nomination page to vote for the cause you find most inspiring. Past winners have ranged from an organization that delivers perishable food that would otherwise have been discarded to the hungry for immediate consumption to a sled hockey team for the disabled. Through the Mark of Distinction award, these organizations were able to further their missions and provide services directly to their communities. Every year Markham produces two wines, one to honor each of the past year’s Mark of Distinction recipients. 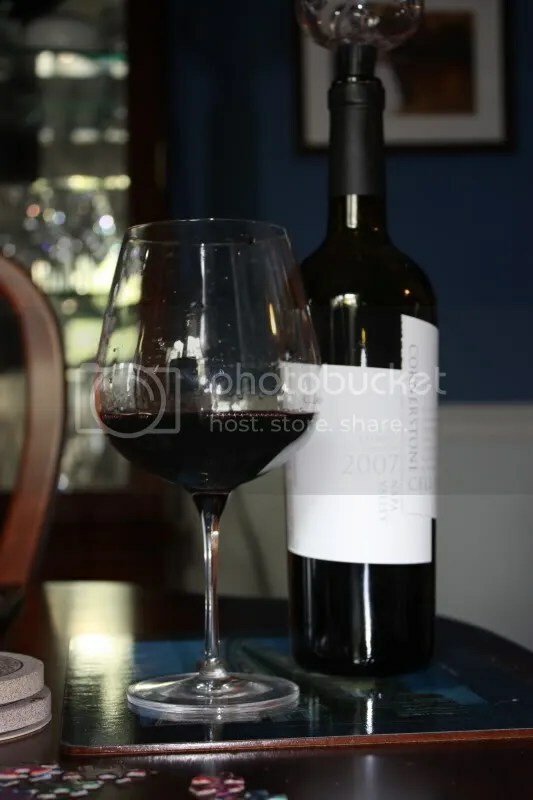 Both are Cabernet Sauvignon, one called the Philanthropist and one called the Altruist. The idea behind the wines is to recognize the recipients and raise awareness of the Mark of Distinction program. 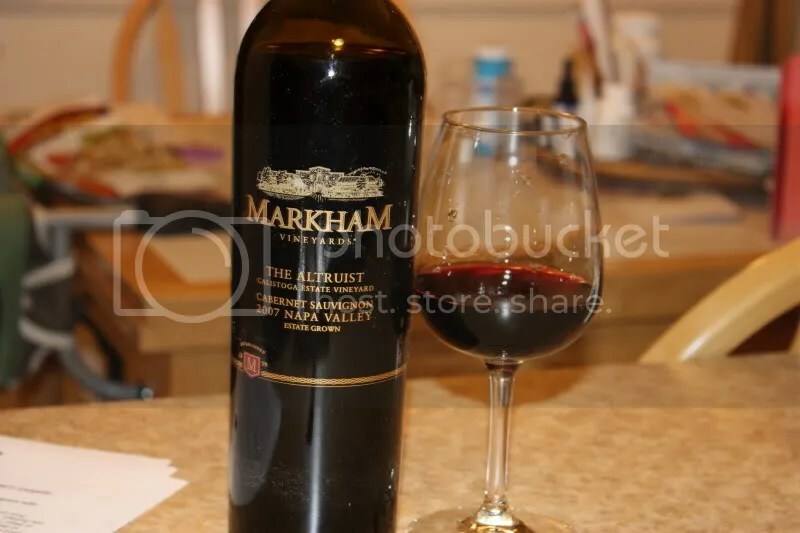 The 2007 Markham The Altruist had a real cork closure, clocked in at 14.5% alcohol by volume, and retails for $55. What about the wine? It’s lovely. 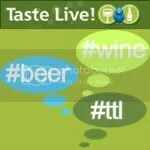 I’m trying something just a bit different here at Wannabe Wino based on the wineblogger conference I just attended. I heard a lot of murmuring that people (I guess bloggers since that was who was in attendance) don’t want to read tasting notes. I’m not sure that’s entirely true, and my target audience isn’t other bloggers, so it’s really neither here nor there. I’ll put my traditional tasting notes in my tried and true style at the bottom of this post, but lets try a slightly new format just for a moment. 1.) If I could only have this wine for a year I would be perfectly happy to continue sniffing and drinking it. The wine had beautiful aromas and flavors that kept revealing themselves as it aired. 2.) I would pay the price tag for this wine myself. 3.) You should drink it with a marbled steak and finish off the night with a cigar and an after dinner glass, if you’re into that sort of thing. Share it with someone who really appreciates the Napa Cabernet style. 4.) Overall the wine reminded me of walking into a coffee shop that happened to be growing an herb and berry garden in addition to grinding fresh beans and baking coffee cakes. Now for my traditional notes format. On the nose I found black currants, blackberry, herbs, fresh bay, sage, and plum. In the mouth I got blackberry, black cherry, cream, herbs, bay, espresso notes, and toffee. Nicely integrated tannins and some time in the glass made this a wine I could pair with a good steak or enjoy sipping on its own.